One of my very best friends lost her father earlier this year. He was a pastor at a local church, one that I attended for years. He was a sweet man, and I will miss him much. My friend is heart broken along with the rest of her family. So for her mom for Christmas, she wanted to make a lap quilt with his neckties, so she could keep him close. She asked if I could do it. I did some research and realized there wasn't a lot of information on exactly how to do these. But I thought I had enough that I felt comfortable tackling it. Plus, I have some really sweet ladies at everything sewing that are fabulous sources of information. I thought I would post a tutorial as I go, so I could help someone else who might want to make one of these quilts. The first order of business is to decide whether you want your quilt to be washable. Some people do, some don't. Obviously, washable is more practical. But not all ties are created equal, and they can get ruined in the wash. I didn't want the painstaking task of determining which of the ties would hold up. Plus, these had such sentimental value, I didn't want to ruin even one. My solution, thanks to my friend, Sandy, at Quarterdeck Quilts, was to make it removable. Genius!! And that is what this tutorial will be all about - making a removable dresden. Most of the information out there says not to use interfacing, because it will shrink. So if you make your quilt washable, wash the interfacing, or use this stuff. It doesn't shrink. I chose to use stabilizer. I'm glad I did. 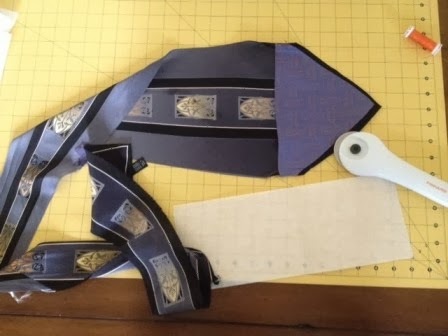 Ties are cut on the bias, and they will stretch and move when cutting and stitching. It is VERY important that your cuts are near perfect. Now let's get into how I did mine. I first decided I wanted a 20 blade dresden. That's roughly 30" in diameter. 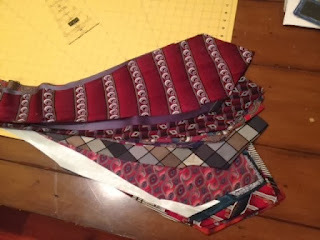 I went through all the ties and chose the ones I wanted by laying them all out on the floor. Next, take your ties apart and remove the layer inside. These are mine taken apart and pressed. Be sure to press first on low heat to remove all the wrinkles and crease lines. Cut your stabilizer about 2 inches longer and 1 inch wider than your dresden ruler. Here is one tie and one piece of stabilizer already cut. Notice I did not remove the lining from the tie before I cut it. I wanted to keep that nice sharp point on the end, and it is so lightweight, I didn't think it would matter. Now line up your stabilizer so the middle lines up with the point of the tie. You want the stabilizer right to the end of the point, not past it. Iron it in place. Now flip it over and line up your dresden ruler so the edges line up with the tie close to the point as shown. This is a closeup but not the same tie. Now, very carefully cut your dresden. Go slowly so you get as even a cut as possible. Here are two of mine cut. Now stitch 5 blades together, so you have 4 quarters. These are my 4 quarters already stitched. And this is one of the quarters from the back. Press all the seams in one direction. And press the front with low heat. Stop right now and make sure you have pretty equal right angles. I don't have that picture. Square up the quarters now to avoid having them wonky when sewn together. If you look at the photo above, you can see if I lined up one side with my cutting mat, the other side would be off just slightly. I did not square mine up and I had a little buckling going on in the center when I was finished. Luckily, it will be hidden by my inner circle. Here are all 4 quarters stitched together. And that is it for now. Your dresden is almost complete. Stay tuned for my next series on how I backed this thing and made it removable from the quilt. If you chose to make a washable quilt, you can simply place this where you want on the quilt and run a satin stitch, blanket stitch or some other decorative stitch around the outside edge. I hope this helps someone else!! Oooooooh! It looks fabulous! Amazing! Wonderful! Can't wait to see the finished product! Where can I find the next step? I have just started a tie project and this was very timely. Some very helpful hints. Thank you. That's great! I would love to see it when you finish. I am happy to have been of any help. Do you think using a stabilizer that is sticky on one side would cause problems? Thanks for your help. Fusible? I used a fusible stabilizer. It's shiny on one side. I wanted it to keep the fabric from moving or stretching. I think I used a mid-weight here, but I would use a lightweight next time just to keep it from being so stiff when finished but still add the stability I needed. Are you washing the ties? If so, you'll want to wash the stabilizer too. Just don't dry it. Let me know if you have questions about that. Or use the interfacing I mentioned. The link is above. It doesn't shrink. HTH! No worries. It's a lot of information to sift through. I'm happy to help. Good luck. I'd love to see it when you finish it. Hi Darlene, it is 10 7/8". I also have an 8" and think it would work well too. I wanted a much larger one for this quilt. Thanks for stopping by. Hello how plates do I need to cut using the 10-7/8 ruler ? Hi Chloe, I hope you get this. You have your settings set to no reply. I used 20 plates with my ruler. 5 in each section - 4 sections total. Thanks for the info. I have an 8" and will use that to make my husband's tie wall hanging. This is what I have been looking for, thanks for the information! Good luck with your project. I'm happy to help. I just finished working on my quilt up to this point. With your step-by-step instructions and the photos it has turned out perfectly so far. Thanks for taking the time to do this. I'm looking forward to continuing with Part 2. A little nervous, but things have gone perfectly so far Iso 'm sure I'll be fine. It's really easy Linda. Just be sure that your pivot point is right on the seam line where the ties are stitched together. That ensures you have a nice tight valley when you turn it right side out. You may even want to baste it first and see how it looks. It's always easier for me to run a second stitch than to rip out stitches. LOL Good luck! Is there any way you could post a link to help me purchase the ruler you used to cut your ties? I’m having a terrible time finding the right one. Beautiful job, by the way! Julie, I'm sorry I am just seeing this. I don't know why I didn't get an email that I had a comment. I will look when I get home this afternoon and post the information. I am pretty sure it is a Fast2Cut by Anelie Beldin. Again, I am so sorry for the delayed response.